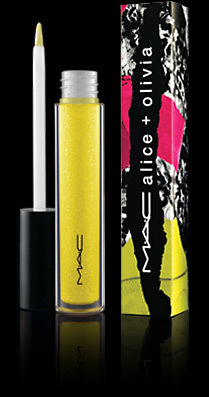 On Wednesday, July 14th, guests crowded into Beauty Bar to celebrate the launch of alice + olivia for MAC Cosmetics. 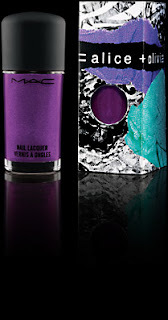 I caught the tail end of the party so alice + olivia designer Stacey Bendet was no longer in sight, but party-goers were still enjoying complimentary manicures with the alice + olivia for MAC nail lacquer shades - So Rich So Pretty (bright purple with pearl), Morning. After (creamy turquoise) and Military (black matte with silver suede pearl). My favorite is the Morning.After! The bar area was packed, as attendees enjoyed cocktails and music by DJ Mia Moretti and DJ Chelsea Leland. 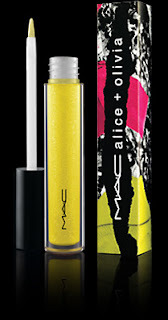 I am excited to try all the alice + olivia for MAC products I got in the gift bag, including all three nail lacquer shades, Partylicious (turquoise with silver pearl) and Later. (black with transforming pearl) pigments and If It's Pink... (hot pink) dazzleglass creme. The outer and inner packaging sleeves of the nail lacquer, pigment and dazzleglass creme feature a collage of elements from Stacey Bendet's Fall '10 mood board. 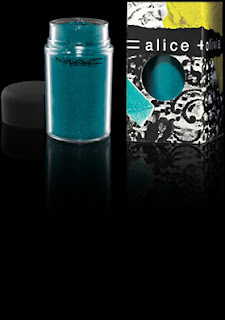 Most of these limited edition products are already sold out at maccosmetics.com. I wish you the best of luck in finding them - they are definitely worth tracking down!